Have you been shopping for school supplies for YOURSELF yet this year? 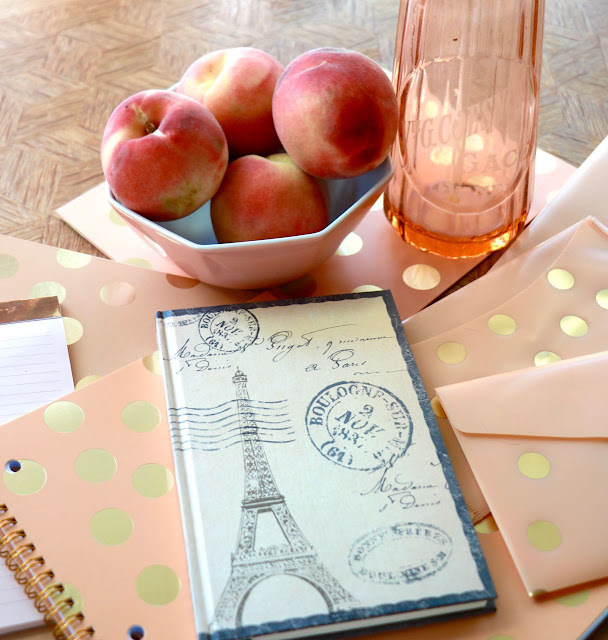 You have to see this beautiful coordinating set of what I'm calling Paris Peach Desk Supplies at Office Depot/Office Max stores. 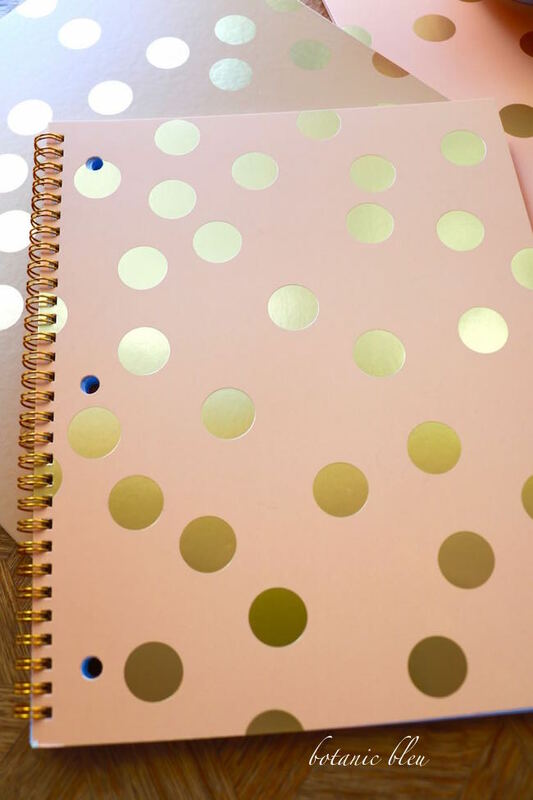 Peach with gold dots, or as the British say, "gold spotty," school supplies serve as desk supplies for grown-ups as well as school supplies for students. 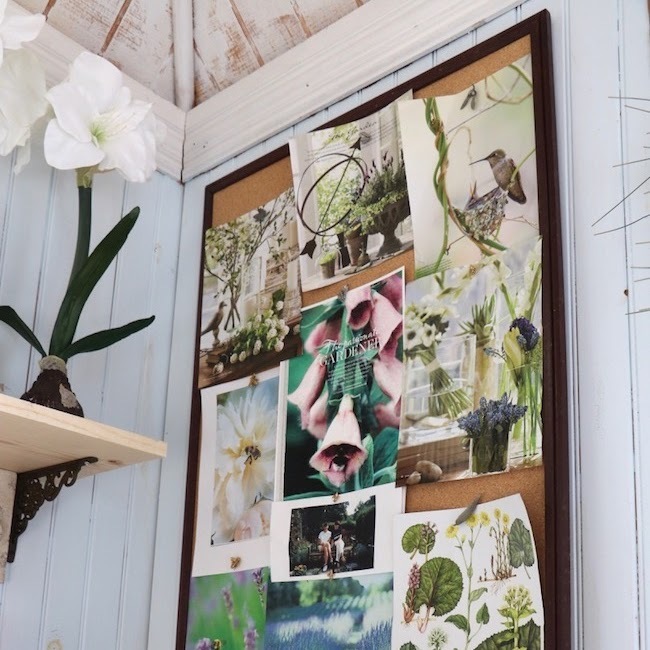 The best part is all of the coordinated pieces are inexpensive office supply store items, not designer boutique stationery even though they look like they could be. 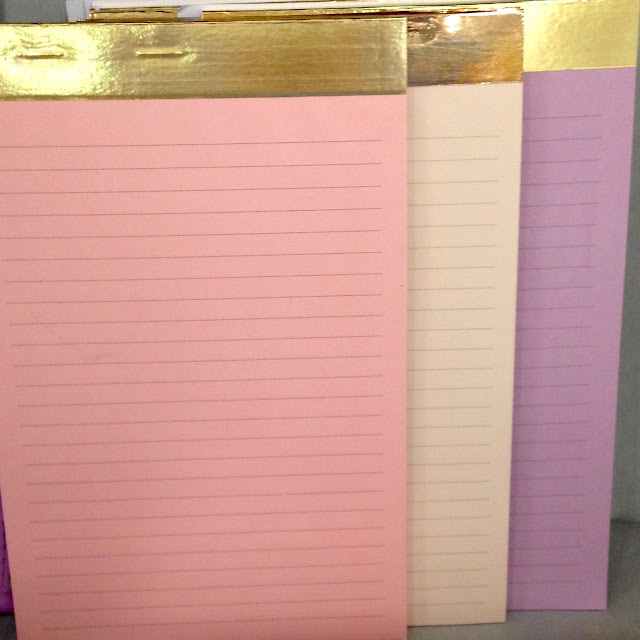 Small notepads come in luscious colors, coral, peach, lavender, with a special touch... a metallic gold top border. The light coral and silver plaid laptop sleeve is padded. There are so many items in this collection... three-ring binder, spiral notebook with a gold metal spiral, small peach notepad, small plastic snap-close envelope, file folder with pockets, and a large plastic snap-close envelope. 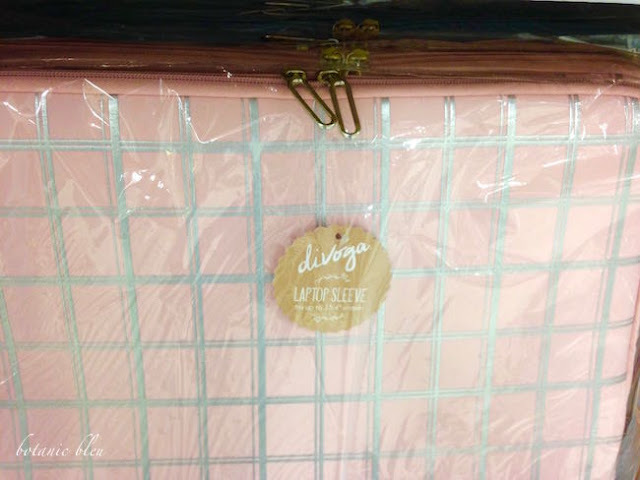 The notebook with the Eiffel Tower cover is not part of this collection, but sold in another section of the store and goes just peachy with the Paris Peach desk supplies. 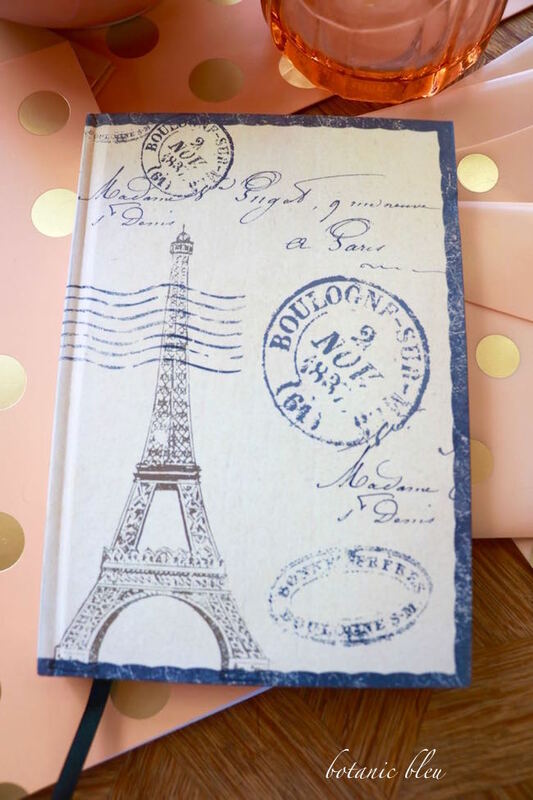 The spiral notebook fits inside the three-ring binder and is perfect for making notes about all the places to visit on our upcoming trip to PARIS. Ooh-la-la... Paris Peach. The small plastic envelope has an open pocket on the back. Tickets for the Eiffel Tower at 2:30 p.m. on September 5, Ste. Chapelle classical concert on September 1 at 7:00 p.m., and Maison & Objet International Trade Show on September 2-6 will be safely stored in one of these envelopes making them easy to find. 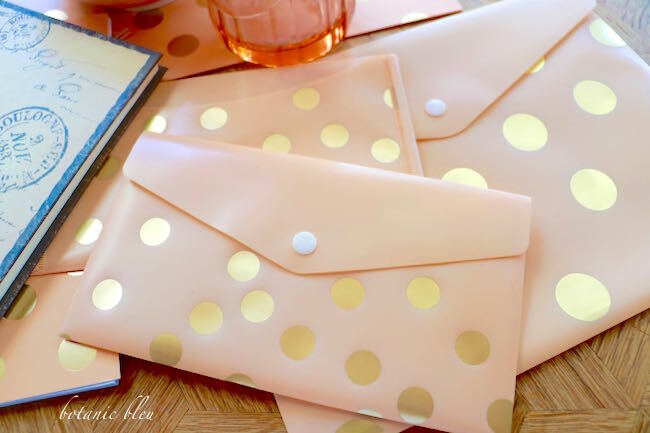 What will go in the other Paris Peach small envelope? Hmmm... Perhaps receipts for all trip purchases to help completing the paperwork for customs on our trip home? The large envelope is just the right size for keeping copies of the vacation package (airfare plus hotel) paperwork, the rental car agreement, and the trip insurance information. Our hotel is in the 1st arrondissement just one block from the famed rue de Rivoli. Do you keep a trip journal when you travel? After traveling with students who were given travel journals from the student tour company, I began keeping travel journals beginning in 1985. They are so fun to re-read and are a great source for specific information about restaurants, hotels, trains, shops, and the weather. Not to mention anecdotes about the quirky things that happened to students, to us adult chaperones, and to travel plans. All the details about arriving at the airport to depart for England with 35 traveling companions... students, teachers, parents... to learn that British Caledonian airlines no longer existed, our flight was cancelled, and we were rescheduled onto British Airways, from Dallas via the newly opened LAX airport in Los Angeles with a six-hour layover, then to London. That was my first visit to California. Then there was the trip in the French Alps by bus that was detoured due to a rock slide that closed the mountain road. We unloaded almost 40 passengers and all our luggage to take an unexpected local train trip through the mountains to our destination, Chamonix. While we unloaded the bus, the tour guide bought our train tickets, and then got all of us with luggage on board within 15 minutes.... the last train of the day to our destination. I still remember the excitement of the train trip through the Alps, standing in the train aisle looking out an open window, with a breeze, taking in all the beauty of the scenery and the mountain air with the Long Tall Texan who was able to go that year. We were giddy with excitement, laughing and talking, just like the students. 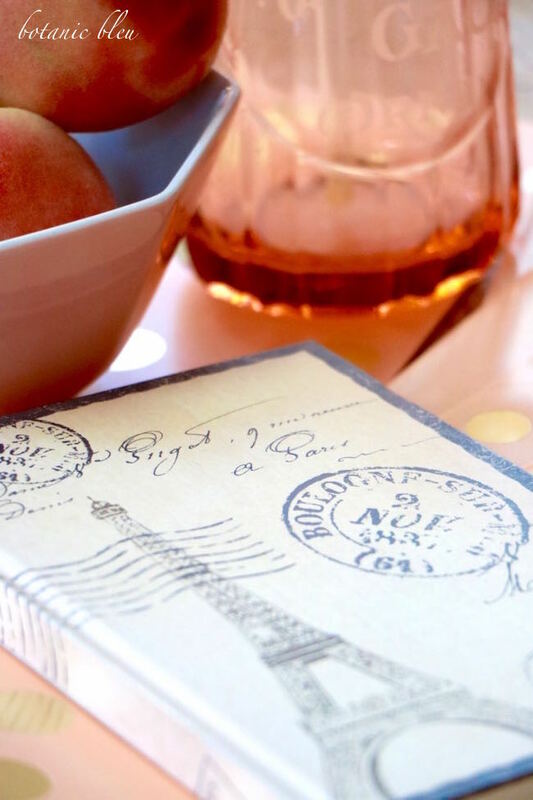 What exciting things will we do and write about in the Paris Peach travel journal this year? 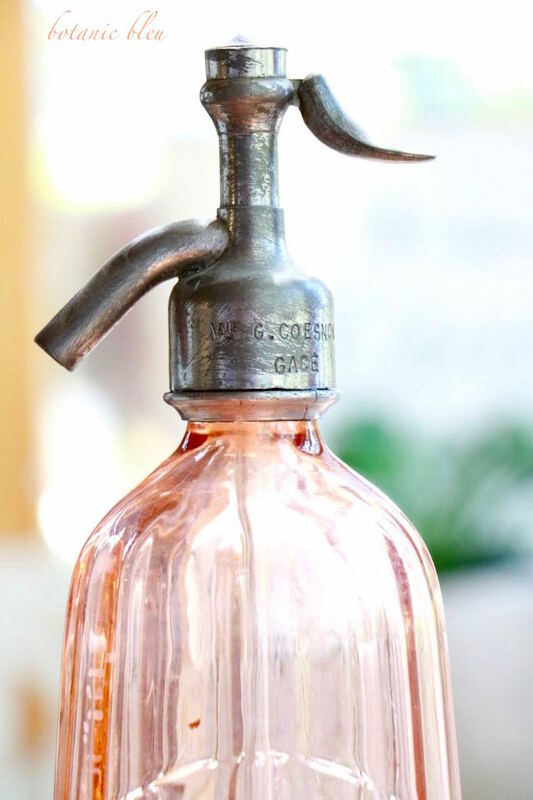 I hope it includes finding a bleu glass seltzer bottle like the peach one I bought in a flea market for my sister the last time we were in France. 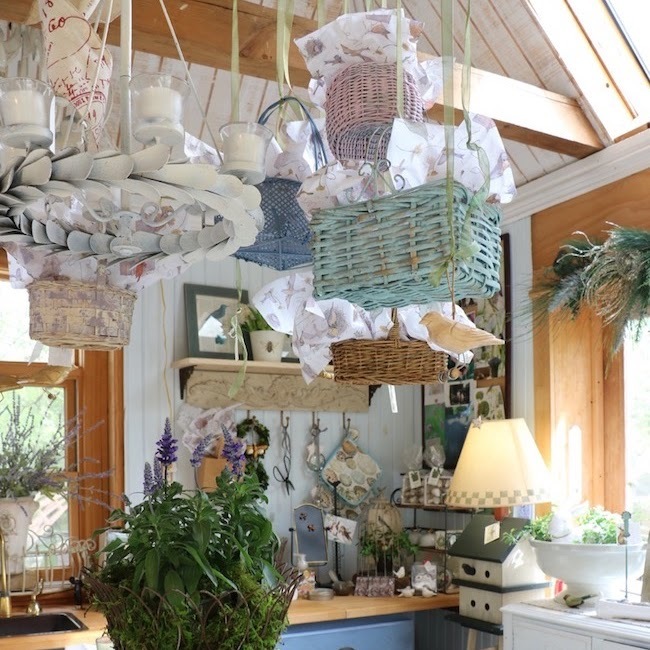 See Carsac Brocante that tells about the flea market where I bought this bottle for my sister. I had to choose between this bottle for her and a bleu Belle Epoque jar since I could fit only one in my carry-on bag. The metal mechanism has the word Paris on the opposite side. 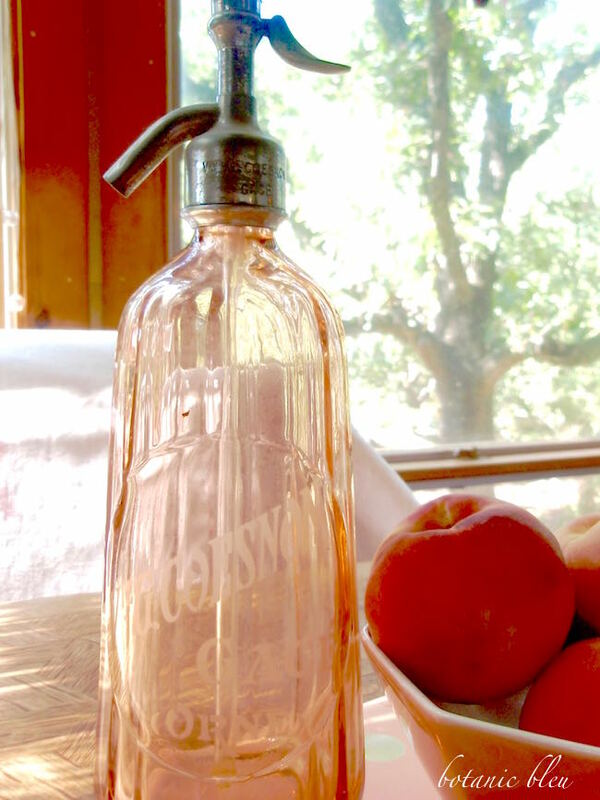 A Paris peach seltzer bottle found in a rural French brocante is the epitome find in flea market shopping in France. 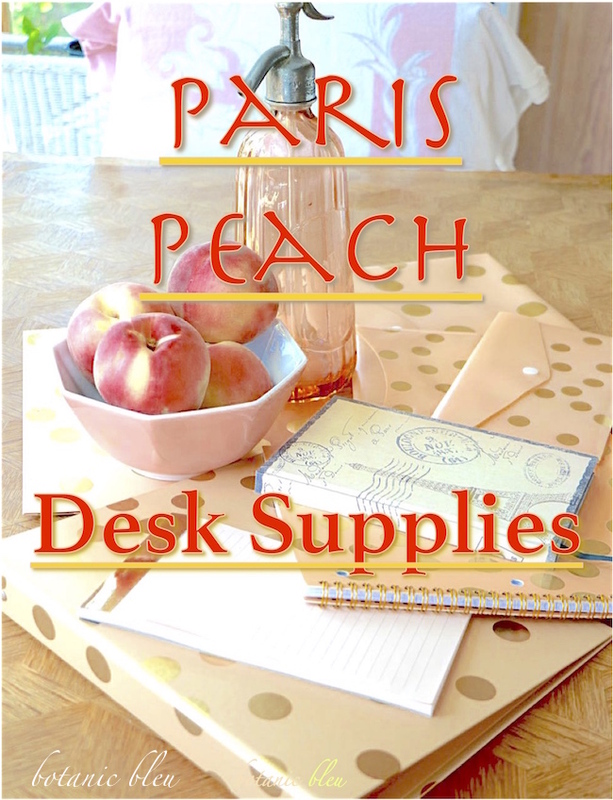 Paris Peach desk supplies probably will be available only this year since the office supply stores usually offer the special designs for one year. Each year something new and different appears. 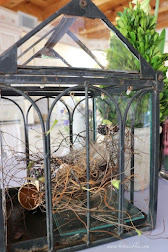 Recently, I posted July, The Blue Hour about a bleu fleur de lis collection that I found a few years ago at Office Max. Have you spotted my new Pin-It button that makes it super easy for you to pin photos to your Pinterest boards? Pin away! How darling! I hope your trip is amazing. That bottle! Gorgeous. Yes, I often keep a travel journal. In recent years I've not been as detailed as I once was, but keep notes all the same. I have my Paris notebook that I add to each trip. So excited for you about your upcoming trip. Did you apply for Global Entry? If so, you don't need to fill out the typical custom form. Very simple return. 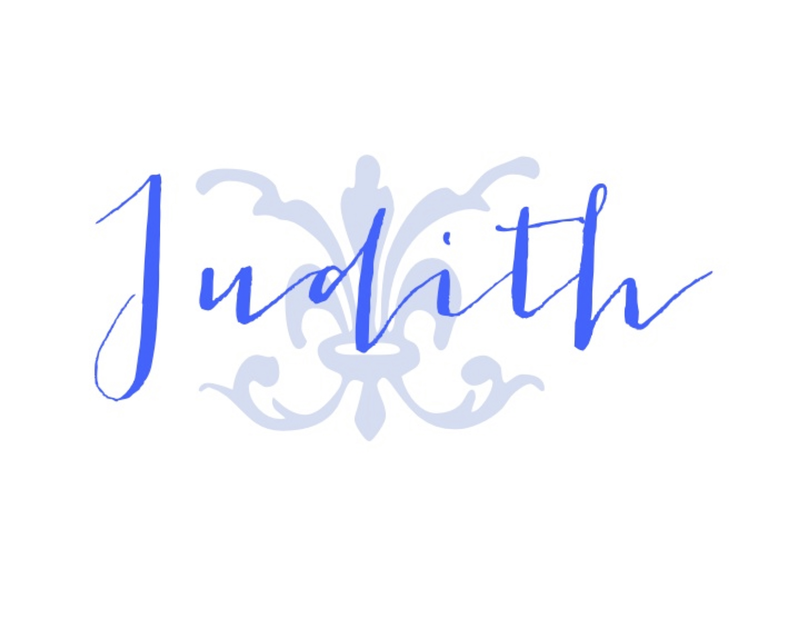 Very lovely, Judith! 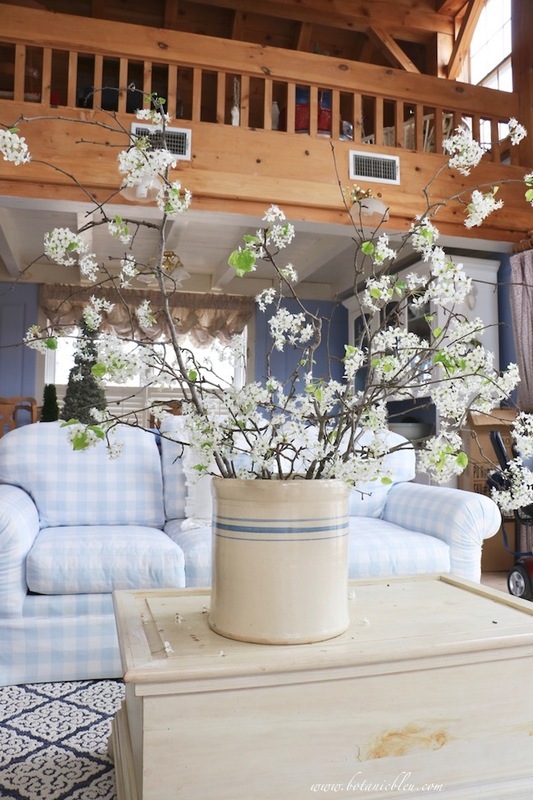 I love peach and it goes very well with the warm glow of your wood in the house! I can't however, bear the thought of back to school yet! Enjoy your week! Beautiful and inspiring photos of Pairs peach desk supplies and such a perfect choice for your upcoming trip. Wishing you safe travels and an amazing trip! What a lovely find and perfect for your trip. Looking forward to hearing about it. 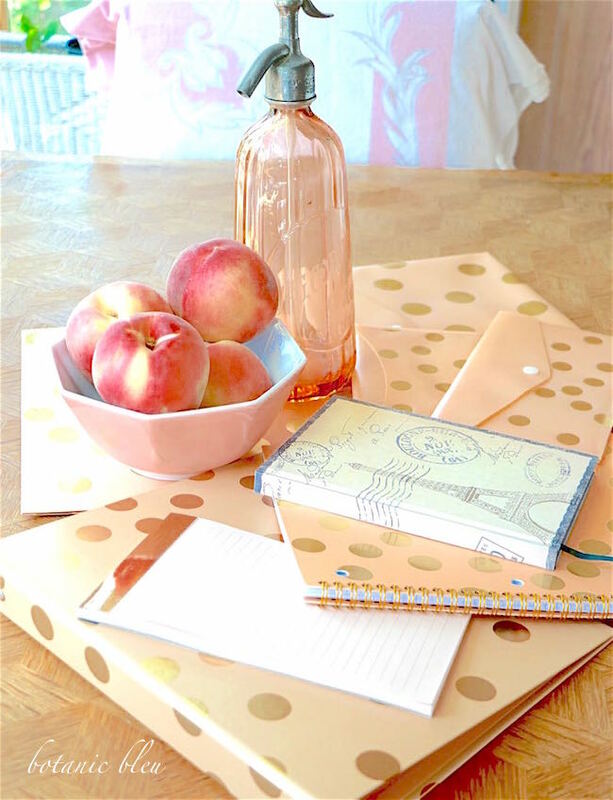 I am loving this peach/gold desk supplies. 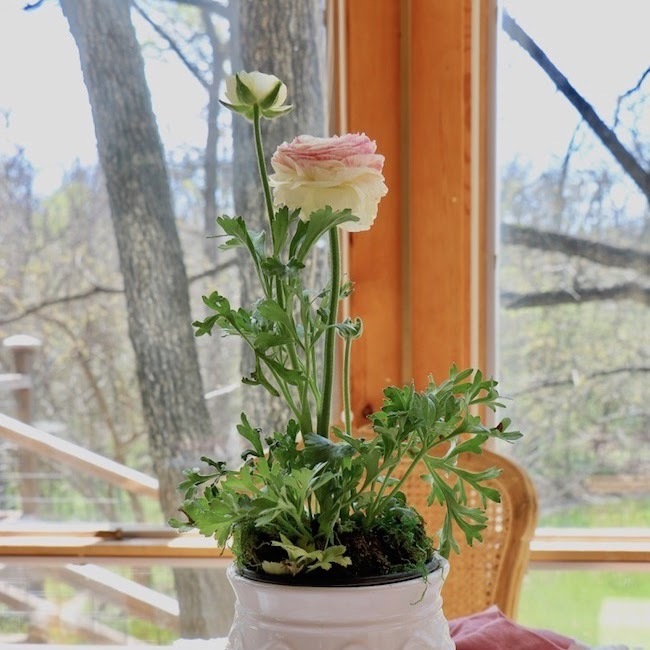 It's gorgeous and love that you shared at Dishing it and Digging it link party. We love having you. I've never really kept a journal while traveling but am tempted to do so after seeing the desk supplies you purchased. They are lovely! Have a wonderful trip and I look forward to reading about your adventure. Love the desk items especially the little Paris book. Have a fabulous trip. Can't wait to hear about It. The supplies you found are really beautiful. Those would make wonderful gifts. Glad you shared these and I love the way you wove the stories. I think it's cool that a store that basically sells utilitarian office stuff in large quantities would have this lovely collection. 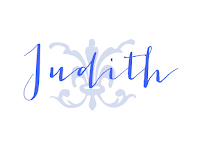 It is perfect for you Judith! I also envy how organized you are! I am sure you are having trouble concentrating on anything other than your upcoming adventure. Beautiful! I am such a sucker for office supply stores as well as book stores and fabric stores! LOL My last office supply store trip finds were gold paper clips and large clips, a pack of colored gel pens and 2 packages of gold and silver ballpoint pens. We sign prayer cards at our staff meetings and several of the pastors have commented on my gold signature as well as the gold messages on the cards that I write. Now I need to go back to find the notepads with the gold borders! Thank you for sharing your finds! Can't wait to hear about the trip to Paris! They are so pretty it makes writing on them a crime. I love that soft peach and gold combination. I have to tell you, I never have any pretty things, my teens are always stealing my stationary. haha! 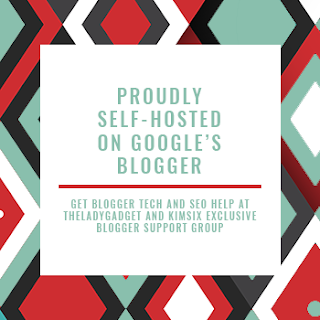 Judith, I am hosting a new link party called Sweet Inspiration and would love to have you join us. It runs Fridays 10am est to Tuesdays. I love office supplies!!! I may have to pick some of that polka dot loveliness :) Thank you for sharing with us at TaDa Thursday!! Can't wait to hear about Paris!! There is nothing like lovely writing supplies. 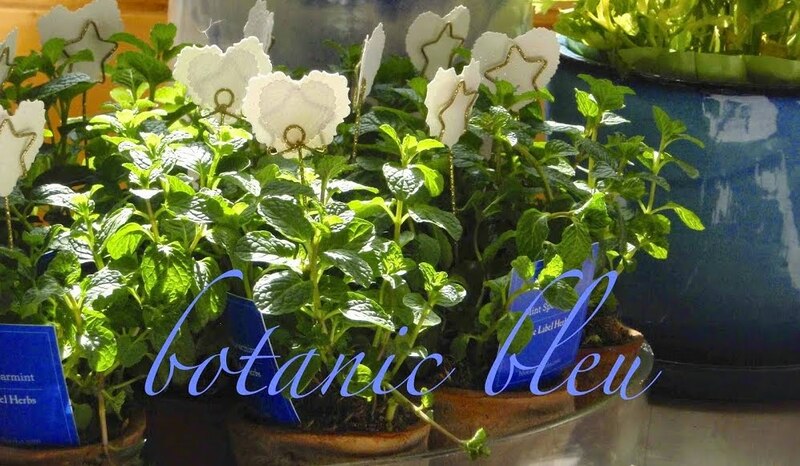 How fun that you will have something pretty to use on your trip. Such pretty things for the desk! Thanks for sharing at Home Sweet Home! 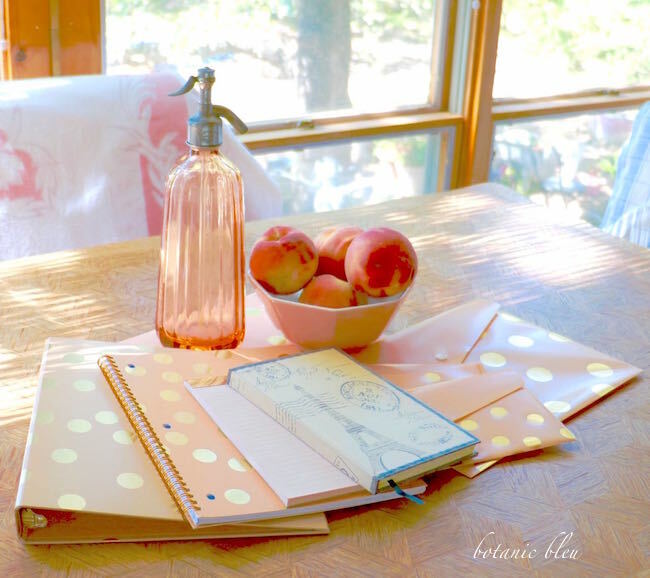 I adore the color peach, it hugs the end of summer and welcomes fall in the most fantastic way and the seltzer bottle is adorable.